A device used in electronic warfare (EW) that emphasizes the older term of electronic countermeasures, but, in the modern classification, usually combines features of electronic support, electronic attack, and electronic protection. Practical implementations usually contain at least one basic electronic warfare function, such as a radar warning receiver or electronic warfare expendables dispenser. In the modern view of EW, it considers threats in all parts of the electromagnetic spectrum, including radar and infrared. Some controllers, especially aboard ships, may address acoustic (e.g., torpedo sonar) as well as electromagnetic threats. A controller has multiple ways to interconnect with the devices it controls. Most commonly, in Western EW systems, this is the MIL-STD-1553B bus, but there is an increasing tendency to use commercial-off-the-shelf interconnection technology such as Ethernet-family devices, possibly ruggedized for the military environment. A new trend is to use radio or laser links between the controllers of multiple aircraft in the same formation, in order to refine the location of a threat. Wireless links may also go to ground, satellite, or unmanned aerial vehicle sensors or cooperating electronic attack equipment. Also connected to the controller, either through a bus or purpose-built interface, is a programming and testing device, such as an AN/ALM-256. Some programming devices can use wide area network (WAN) communications to take new threat and countermeasure information, in real time, from a remote command and control system, and load it into the controller. 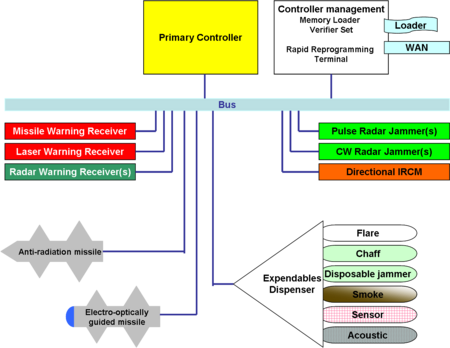 The diagram also shows that while the basic controller connects to "soft kill" devices such as jammers and decoys, it can also cue "hard kill" weapons to destroy an adversary's defensive device. For example, cueing can include telling an anti-radiation missile the frequency and other signatures of a threatening radar transmitter. The cueing can be even more interactive, as the controller can cue the imaging sensor of an electro-optically guided missile, such as the AGM-65 Maverick, to the threat, and let the weapons system operator visually verify the hard-kill weapon is aimed at the desired antiaircraft gun or missile launcher. Newer hard-kill mechanisms included directional infrared countermeasures, which, rather than sending a missile with an explosive warhead, send a beam of intense light into an infrared sensor to burn it out. Examples include the AN/ALE-47, of which the core feature is a countermeasures dispenser, and the AN/APR-39, based around a radar warning receiver. Some of these devices, such as the AN/ALE-47, have alternate operating modes that let the controlled devices operate autonomously or under manual control, especially if the controller fails. The AN/ALQ-213 is purely a controller, with no dedicated sensors or countermeasures. This page was last modified 16:15, 15 April 2011.